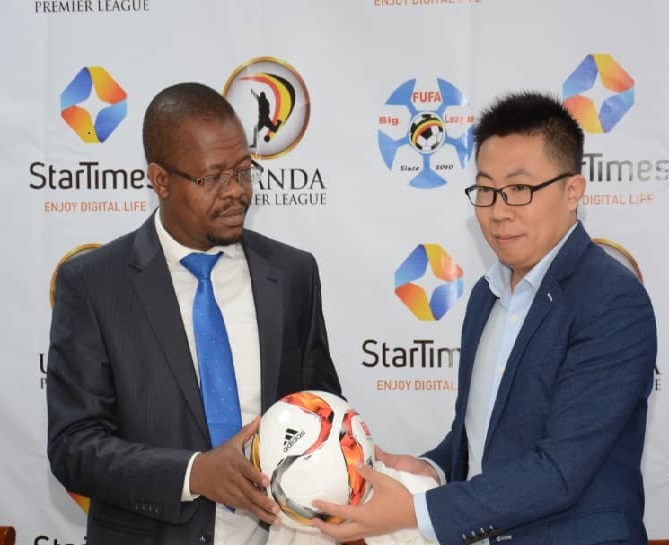 PayTv Company StarTimes has secured rights for both title and broadcasting rights of the Uganda Premier league and FUFA Big league. The deal will see StarTimes invest a whopping $7.24 Million (Shs 28 Billion) in the two leagues for a period of 10 years. This is the biggest investment in Ugandan Sports history, surpassing the $3 Million that Sports Broadcasting had paid for the same rights earlier this year. FUFA and Sports Broadcasting are understood to have terminated their contract by mutual understanding a few months ago to pave the way for StarTimes. Speaking at the launch of the partnership at Hotel Africana on Thursday morning, StarTimes CEO Andy Wanga explained that the rights secured also include distribution of all audio and visual transmissions. “The media and commercial rights also include public viewing, distributing all content media and commercial rights including public viewing broadcasts, distributing all content relating to audio, visual and audio-visual transmissions of matches through all platforms and in all forms of distribution, said Wang. “We took the decision to give back to the people of Uganda through football because of their passion for the game, added Wang. “It touches a lot of people from the grass roots so it is our way of thanking the public for supporting our business and making us the leading pay television with 70% market share after only eight (8) years. It is also worth noting that StarTimes are the official sponsors of reigning Uganda cup holders KCCA FC and their stadium, the StarTimes stadium in Lugogo. The PayTv Company has already invested Shs 4.5 Billion for a period of seven years in those two projects and is also a former sponsors to troubled side, SC Villa. FUFA President Eng. Moses Magogo expressed his delight that a deal between Ugandan football and StarTimes had been struck. “We are so grateful that today we enter into a huge partnership with StarTimes, said Magogo. “The deal with Startimes is in line with our target of making Ugandan football the best on the continent. “We are aware that we still have a lot to do in order to achieve that but we are confident we are on the right path. With StarTimes broadcasting in over 38 African countries and up to six on the Asian continent, the move to acquire rights for the two biggest leagues in Ugandan football will clearly benefit both the local clubs and players as they get a chance to attain much craved exposure on the continent. The games will be broadcast live on StarTimes but it is still unclear which channel will harbor the Ugandan games as the PayTv has four football channels-World Football, Sports Premium, Sports Focus and Sports Life. “The legacy we want to leave behind in the Ugandan local community is the support towards the development of football-the game that unites the whole country without bias. “A strong top division league reflects on the strength of our national team, the Cranes. The now newly branded ‘StarTimes Uganda Premier League’ will kick off in three weeks’ time while the ‘StarTimes Big League’ begins in a month.